It’s important for B2B organisations to be aware that an individual’s consumer experiences will also shape expectations in their business life. As the world comes to be more consumerised, new boundaries are being crossed and lines blurred in the business realm, and with these new challenges comes a rapid change of pace which organisations will need to adapt to. They’ll need to go beyond traditional B2B strategies to deliver rapid innovation and experimentation to make sure the impact on their organisation is positive in this changing climate. It’s important for B2B organisations to be aware that an individual’s consumer experiences will also shape expectations in their business life. For example, when interacting with other organisations, supplier and partner transactions need to mirror the convenience and speed that consumers today have come to expect. Even more so, as products become more and more commoditised, service becomes a key competitive differentiator. Profits increasingly come from the service on the items sold, as these are not in general negotiated or reviewed, and are at much lower cost than the original item and running in a different account segment. Those companies which provide better customer service and hence a better overall customer experience will have the competitive edge. The internet of things (IoT) offers B2B businesses tremendous value by delivering vast amounts of insightful data right from the buying cycle all the way through to customer and field services. While this is an immense opportunity to create value for customers in an even richer way than a consumer product or service is typically able to, it presents a few challenges. To put it into perspective, think of an elevator system, an airplane, or manufacturing equipment; data about the usage and performance of a product can be leveraged for predictive maintenance, which uses machine learning to predict failures and allows businesses to perform maintenance tasks and replace parts before the product fails – a lot more refined than a typical B2C transaction which hardly ever requires as much post-upkeep. Is it realistic to expect B2B to act like B2C? Nonetheless, the application of B2C strategies in a B2B environment does not come without significant challenges. While both B2B and B2C customer service should be treated equally, the reality is that in most cases, the financial value of B2B products and services deals tend to be higher than their B2C counterparts. The way B2B businesses buy is completely different and a lot more complex; the products are also more challenging to install, maintain, service and repair. Couple this with the fact that there is a much higher urgency to respond to service requests, as any fluctuations are likely to impact the customer’s revenue. Therefore, accountability when things go wrong is high. The other notable difference about B2B is that an organisation will need to deal with not one individual but different people in the customer organisation – whether it is during the buying cycle or later. Imagine also, that once the product or service is deployed, it has the potential to reach thousands of ‘users’. Businesses need to leverage multiple sources of data to engage with a range of decision makers in an organisation and always be able to tie it back to key account metrics, unlike B2C which typically does not involve a myriad of people during the entire process. What then is the vision and strategy that organisations need adopt to overcome these challenges? B2B businesses need to remove traditional silos/barriers between departments to attain a 360-degree view of the customer and make this insight available throughout the entire organisation. Everyone’s contribution is pivotal to creating a positive B2B customer experience. For this to happen, businesses need to drive change management and put the right measures and metrics in place, and to deliver a superior service to prove that they can provide a frictionless service. For example, if a machine breaks down and a new part is required, allowing AI and ML technology to identify and order a replacement, instead of a technician, can significantly reduce time, and lead down the path to a more effortless customer journey. Increasingly we’re seeing a turn to these new technologies to drive a positive customer experience, and mixed with typical B2C strategies, are finding this to be a route to success. Businesses also need to get the right mix of machine learning and human contribution to be able to leverage the balance between premium service and efficiency, but all too often, customer service fails when B2B organisations think they’ve nailed the right technology and decide to sit back because their job is done. Failure is also in the cards for those organisations which dive head-on into customer service technology without fine tuning the balance between technology and humans. Automating processes powered by Machine Learning and predictive analytics will continue to drive efficiencies and transform customer services into profit centres. But by placing a premium on human service contact at key moments in the customer journey, much like B2C companies do, businesses will deliver welcomed experiences through value-added services. A great way to showcase this is that if a customer wants an instantaneous answer, it’s best to live chat with an expert, who was chosen based on the conversation a customer had with a chatbot, rather than waiting for a response from a generic email. New technologies allow for efficiency in B2B organisations, but it’s the mix of human interaction that you see with B2C companies that really allows a seamless delivery of value to the customer. In such a fast-moving digital age there is no such thing as future-proofing. 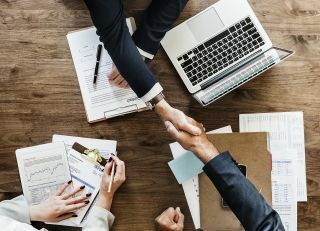 Without a doubt, however, understanding the positives of adopting B2C strategies for customer services is pivotal in the success of B2B organisations. While B2B challenges do differ in comparison to B2C, they can still leverage B2C strategies when taking advantage of processes powered by Artificial Intelligence and Machine Learning. If fine-tuned appropriately, these technologies will be the prerequisite for profitable omnichannel contact centre experiences, where data can be continuously drawn upon to deliver responsive engagements to the relentless evolution of customer expectations and channels.